Though reliable sources for the early origins of a holiday to celebrate friendship in the US are scarce, it is probable that the first Friendship Day was proposed by the Hallmark greeting card company in the early 1900’s. Despite Hallmark’s attempt, the holiday’s luster had faded by the end of the century only to be resurrected by citizens of several Asian countries in the early 2000’s. Renewed interest in a day of friendship eventually led the UN General Assembly to proclaim July 30, 2011 the first International Day of Friendship in over 40 countries. Aside from the International Day of Friendship celebrated on July 30 annually, other countries (including the US) celebrate Friendship Day on the first Sunday of August or other dates. In 2015, Friendship Day will be celebrated by the US on August 2. The ambitious intentions of the UN-established holiday were to promote friendship between cultures, countries, and individuals in an effort to maintain peaceful relationships on a global scale. On a less ambitious level, the holiday gives us a reason to be mindful of the great people in our life that we are privileged to call our friends. For us simple dog lovers, a day of friendship would not be complete without also recognizing the furry barkers in our lives that meet our most crucial needs for a fulfilling friendship. Whether playing fetch at the park, taking a long walk, or eating a meal together, it’s safe to say that most dog lovers have as much fun watching their pooch enjoy life as their dog has living it. I can’t help but smile at the look of sheer joy in my dog’s eyes when I reach for his leash or go to his food bin. The excited pitter-patter of his toenails on my wood floors makes life a little happier every day… just like a good friend should. Now if I could just get him to stop peeing on my garbage can, he would be a daily ray of sunshine. The comfort a dog brings after a brutal day at work, an argument with a spouse, or even the loss of a family member is hard to compare. There aren’t many friends that will listen to you whine, without interruption, about your woes and your fears, your pains and your struggles, your insecurities and your weaknesses, for as long as a dog will. And in a show of emotional solidarity, you are also the first person your dog wants to communicate with to display their fear from the thunderstorm apocalypse or exude their rage when the evil mailman comes just to mess with that squeaky mailbox hinge again. And yes, I really have talked with my dog about life on occasion. If you’re reading this, I’m sure you understand. When it comes to being loyal to each other, most dogs and humans have it down. For thousands of years our species had each other’s backs during the struggles of early civilization. 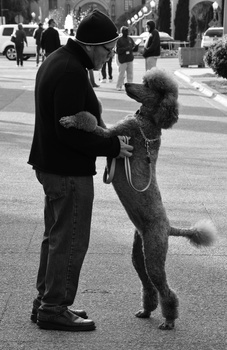 However, the 20th century saw a renaissance in regards to our relationship with dogs. The movement of dogs from the backyard dog house to our bedrooms led to a major paradigm shift in regards to what humans and dogs expected of each other. No longer was every dog going to work for its dinner. Rather, the dog now had dinner provided for it in exchange for a more significant emotional connection with its owner. It could be argued that the movement from a working relationship to a more close living, emotional relationship with our dogs was a major step forward for building true loyalty between our species. Unfortunately, our loyalty to each other is still a work in progress. While compassionate dog lovers understand that calling a dog your own comes with a lifelong commitment, sadly, some people are not always so loyal when it comes to their dogs. In full disclosure, I’m not so sure my little terrier, Kyle is very loyal to me either. Every time he pulls one of his Houdini-like escapes from the back yard, the sheer magnitude of adventure which exists in our neighborhood swallows him whole. I’m quite certain his memory of me is erased the second he makes his break. Let’s face it. Life can get rough. Sometimes the stresses of money, health, work, and family can be overwhelming. Like a good friend however, our dogs are always there to lighten our spirits and show us that everything is actually just fine. Their short term memories for the bad times and their never ending excitement for the little things, let us know when we are taking ourselves, and our lives, a bit too seriously. For me, this may be the single greatest reason to have a dog. For this alone, I’ll make sure to give my favorite canid co-pilot a little extra love on Friendship Day. Because, let’s be honest… who makes a better friend than a dog? Happy Friendship Day 2015 from Paw Print Genetics!